Here we are in 2014 and if inclined to look back we will most likely be thinking of the start of the Great War 100 years ago. We could be forgiven in thinking that commemorations of the War of 1812 are 2 years past – but in reality it was still raging 200 years ago. The War had largely missed the Quinte area - military action had taken place to the west and east. Most of the local male population was enrolled in the Militia and sometimes groups went off to distant hot-spots when the alarm was raised. The area's greatest role was as breadbasket for the colony and as part of a vast transportation network that linked Britain to her distant western out-posts. 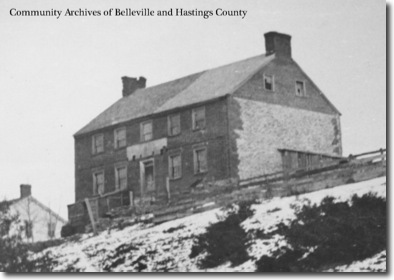 That all changed on April 4, 1814 – Belleville's most violent day of the War. Both the river in Thurlow Township and tiny hamlet at its mouth had become known as “Meyers Creek”. Its namesake, Captain John Walden Meyers was a larger than life individual. He had been a hero of the Revolutionary War and his exploits had earned him a legendary reputation. His American enemies had noted him for “courage and daring rather than brutality or ferocity”. Though not the first on this River, his mills built in 1790 created the impetus for growth and he is usually considered the community's “founder”. By 1812 the village was still small but thriving. Captain Meyers' sons were officers in the Militia when war came – but not John Meyers himself, ironic for a man with such a military reputation. In fact, Meyers took a decidedly ambivalent stance to the War of 1812. Although a “most active and zealous partisan” in the Revolution and very involved in establishing settlement on the Bay of Quinte, he seems to have retired from public life by 1812. Meyers also faced stiff competition and rivalry from other prominent citizens – most notably James McNabb, a fellow Justice of the Peace and now local Commissary Agent. A feud seems to have developed between these two men. Meyers took very obstinate – and from our standpoint, rather humorous – actions in response to orders from McNabb. He refused to sell his flour at the government's deflated prices, he hid his sleigh, and he refused to furnish his horses - even threatening to shoot the Constable if he tried to take them! Finally, after being ordered to join a wagon-train taking supplies to York (Toronto), Meyers got as far as Brighton where he unhitched his team and returned home leaving the wagon on the road! The 1812 myth tells us how the patriotic Canadians rose up to throw off the marauding Americans – and that did happen in times and areas of invasion. However, Meyers' stance was not that unusual other than coming from one so part of the “Establishment”. Alan Taylor in his book “The Civil War of 1812” devotes an entire chapter to “Traitors”. He says “that most of the people just wanted to be left alone to tend their farms, …. farmers wondered why they should sell their hard-earned crops at modest prices for an uncertain payday, when they faced war inflated costs of imported goods and farm labor”. By 1814 Martial Law allowed the Commissary to seize what they wanted. The populace was tired of a war that seemed to be going nowhere and was greatly interfering with their livelihoods. Meyers probably felt that he had already sacrificed enough for King and Country. Into this environment rode a large contingent of British troops on the night of April 4, 1814. They were Troopers of the 19th Light Dragoons – technically mounted infantry but for all intents they were cavalry – the only British cavalry that served in the Canada during the War of 1812. They were on their way from Kingston to the Niagara frontier to join the 1st Squadron under Major Robert Lisle. One of the Dragoon officers described the Bay of Quinte area as “one of the most fertile and best settled parts of the upper province”. James McNabb was charged with finding billets for these troops and their mounts as they passed through Meyers Creek. Captain Meyers relates that Sylvester Burns (seemingly the main culprit) demanded that Meyers get up and prepare some food while threatening to strike Meyers with a heavy candlestick. Meyers refused, reached out from his sickbed, and grabbed the candlestick from Burn's drunken hands. Even at the age of 69 and sick in his bed, John Walden Meyers was a force to be reckoned with! A tall, large, powerful man with wild, red hair (maybe grey by now?) he had acquired a “boogeyman” reputation during the Revolutionary War - American mothers warned their miss-behaving children that Captain Meyers would come and “eat them”! An enraged Burns retreated but threatened to return with his sword and cut off Meyers' head! Meyers bolted his bedroom door, loaded his gun, and warned Burns that he would shoot if he returned. According to McNabb, Sylvester Burns “did also severely wound a Mrs (Eunice)Richardson with a Sword in the head, so that, her life, I conceive to be in danger.” Jane Bennett Goddard in her massive biography, “Hans Waltimeyer”, claims that a Mrs. Hamilton (a household servant - maybe the same person as Mrs. Richardson?) died as a result of the attack giving rise to one of Belleville's earliest ghost stories. Well-known Belleville doctor, the late Ken Douglas, lived for a time in the house that now stands where “Meyers Castle” had been. Dr. Douglas claimed that on several occasions he heard very strange moaning sounds emanating from his basement. On one occasion even a neighbour heard the ominous sounds! Scary stuff!! The attack was broken by the intervention of a Corporal Medcalf and some sober Troopers – Burns, Perkins and Thompson were arrested and turned over to the Civil Authorities. They were to appear at the Quarter Sessions of the Peace to be held on April 26. There is a good chance that they were executed but what became of these men remains a mystery. 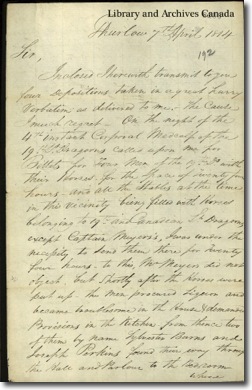 Captain Meyers recovered from the attack and his illness but it is possible that his wife may not have – Mary or “Polly” Meyers is never heard from again and John had re-married around 1817. Biographer Mary Beacock Fryer in her book “Loyalist Spy” suggests that Meyers may have experienced an “eerie sensation” of nemesis for his own night-time raid on the house of American General Phillip Schuyler during the Revolution. The incident is a stark reminder of the nature of war even here on the “home front”. It opens up a window on the tensions between the British military and Upper Canadians and reveals something of the public mind-set regarding the War. James MacNabb had failed to see any humour in Meyers' war-time actions and he proceeded to lay charges of dis-loyalty against Captain Meyers. This was not a trivial thing to do when the penalty for treason was hanging! However, McNabb's purpose seems to have been “to prevent, as far as possible such undeserving characters from obtaining further marks of Royal Bounty”. McNabb and others went further by pushing to have the Meyers name removed from the community and in 1816 the community was re-named “Belleville”. A biographical portrait of the “Founding Father” of Belleville, Ontario, Captain John Walden Meyers, a notorious American Loyalist and a prominent Canadian pioneer. While a ‘hero’ of the Revolutionary War, the War of 1812 was a somewhat different experience for Captain Meyers. Representative of much of the population of Upper Canada, Meyers was reluctant to support the war effort and was actually accused of treason! Meyers and his wife also endured a vicious attack in their own house – by British troops! This excerpt showcases life on the ‘home front’ in the Quinte area 200 years ago.